Blue_Plastic_Envelopes_with_VELCRO_brand_Closure is rated 5.0 out of 5 by 2. Rated 5 out of 5 by JB Henderson from Great Product We love the blue envelopes. They are a nice quality and a pretty color. Plus our order came so quickly. Rated 5 out of 5 by suz anne from project file I have been trying to buy specific colored project files for years & have not been able to find them. I needed a significant qty and could only find multi color packs of 5 with colors I had no use for. So I am very glad to be able to get the colors I need in the qty I want. When do you anticipate getting more in stock? These envelopes will be fully restocked in June. Thanks for your question! Judging a desk by its organization is a lot like judging a book by its cover, it might not be accurate, but people do it. Use these smart looking Blue Plastic Envelopes with Velcro® brand closure to resourcefully file work documents and keep your desk clutter-free. 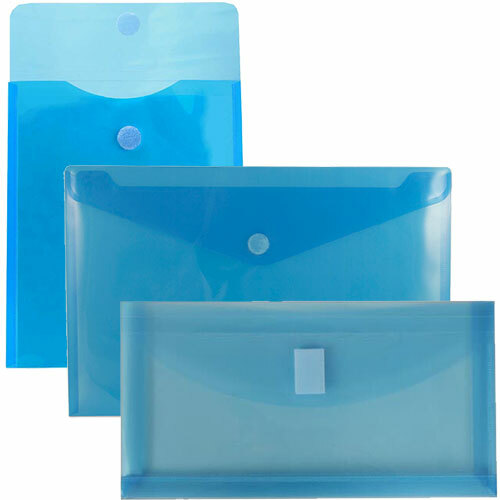 Blue Plastic Envelopes come in an assortment of sizes to hold everything from index cards to large booklets. Envelopes are also available in 1 inch and 2 inch expansion in order to accommodate materials that build up. The blue color is a commonly appealing one.The strong Velcro® seal makes opening and closing easy.